Inadequate amount of tears —Tears are produced by several glands in and around the eyelids. Tear production tends to diminish with age, with various medical conditions, or as a side effect of certain medicines. Environmental conditions such as wind and dry climates can also affect tear volume by increasing tear evaporation. When the normal amount of tear production decreases or tears evaporate too quickly from the eyes, symptoms of dry eye can develop. Inadequate oil production — The tear film is made up of three layers: oil, water, and mucus. Each component serves a function in protecting and nourishing the front surface of the eye. 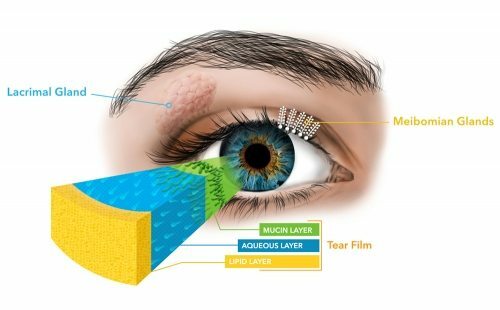 A smooth oil layer helps to prevent evaporation of the water layer, while the mucin layer functions in spreading the tears evenly over the surface of the eye. If the glands producing the oils do not function properly, the water layer evaporates too quickly and leaves the eye exposed, thus causing dry eye symptoms. 86% of Patients with Dry Eye Have MGD. It's Treatable. When the meibomian glands, the tiny glands located in the eyelids, do not sufficiently produce and release the oils needed for protecting and ensuring a healthy tear film, this is known as MGD. Often over time, due to a lack of blinking or general debris in the eye, these glands become blocked and stop producing the needed oil to protect the watery layer of the tear film. speedTest Early diagnosis is essential because if left untreated, the glands will deteriorate over time and there is no way to recover from gland loss. MGD can occur at any age but is more prevalent in adults over 40. The increase of MGD is largely due to the common use of digital display devices today as we are teaching ourselves to blink less creating “evaporative stress”. Over time, the oil in the glands thickens, creating blockages of the gland opening and often oil production ceases. Treatment for MGD may include various methods but the most effective is the FDA cleared LipiFlow treatment. LipiFlow uses thermal heat pulsation that essentially “melts” gland blockages and a light massaging action to remove those blockages. In these cases, treatments can range from tiny plugs placed in the corner of the eye to aid in the healthy tear production to prescription medication. Many patients find temporary relief from over-the-counter artificial tear solutions. There are also various self-treatment options such as warm compresses, nutritional supplements, and lifestyle or environmental changes. These treatments aim to restore or maintain the normal amount of tears in the eye, minimize dryness and related discomfort to maintain eye health. Age—dry eye is a part of the natural aging process. The majority of people over age 65 experience some symptoms of dry eyes. Gender—women are more likely to develop dry eyes due to hormonal changes caused by pregnancy, the use of oral contraceptives, and menopause. Keep in mind, however, MGD is common among all genders. Medical conditions—persons with rheumatoid arthritis, diabetes and thyroid problems are more likely to have symptoms of dry eyes. Also, problems with inflammation of the eyelids (blepharitis), inflammation of the surfaces of the eye, or the inward or outward turning of eyelids can cause dry eyes to develop. Eyelid hygiene – Often debris from the eyelashes and the lid margins are the culprit of contributing to MGD. Lid hygiene is key to maintaining health of the meibomian glands and surface of the eye so both the lashes and lid margins should be cleaned regularly. Environmental conditions—exposure to smoke, wind and dry climates can increase tear evaporation resulting in dry eye symptoms. Failure to blink regularly, such as when staring at a computer screen for long periods of time, can also contribute to drying of the eyes. Other factors—long term use of contact lenses can be a factor in the development of dry eyes. Refractive eye surgeries, such as LASIK, can cause decreased tear production and dry eyes. What can I do differently to treat my dry eyes? How is dry eye and MGD diagnosed?